Although the red fox (Vulpes vulpes) is naturally an animal of woods, moors and farmland, in recent decades, the number of foxes living in towns and cities has increased enormously, with some estimates suggesting that as many as 10,000 may be living in the London area alone. For many people, seeing wildlife in their own garden can be a source of great pleasure, though the addition of foxes to the list of visitors may not be so universally welcomed. A clever and resourceful predator, the fox has a long – and largely deserved – reputation for wily cunning, which can make dealing with a fox problem something of a challenge. Though urban foxes are clearly of particular concern to those with rabbits, guinea pigs and other small pets, their potential nuisance is not confined to snatching a quick meal; they can make their presence felt with digging, fouling and the occasional bin-raiding too. Foxes are one of those pests for which there is often no single solution and so, if they are unwelcome visitors to the garden, then sending them on their way is not always easy. Foxes principally come into gardens for food and shelter – so one of the best ways to stop them calling is to make sure that they can get neither. In most cases, erecting a stout perimeter fence to keep them out is likely to be prohibitively expensive – not to say ugly, too – but a few simple precautions should help make such extreme measures unnecessary. Opportunistic feeders, foxes eat a remarkably wide and varied diet in the wild, including birds, small mammals, earthworms, beetles and berries. When it comes to an urban menu, they are just as open minded and always grateful to accept whatever is on offer in the way of a free meal. While some people actively entice foxes by feeding them, sometimes those who have no wish to have a fox visit may be encouraging them inadvertently, since any forgotten scraps left in the garden look like easy pickings. Uneaten pet food, barbeque left-overs, food put out for the birds, even kitchen scraps on a compost heap can all provide a meal for a hungry fox – who will very quickly learn to return, if the rewards are good. Foxes will raid rubbish for food, but nothing like as often as is commonly believed – cats and dogs being the more usual culprits – and in any case, the widespread use of wheeled bins instead of bags has made this a less useful resource for the urban fox. However, the upsurge of composting – especially on open heaps – can make kitchen scraps available; where urban foxes are a problem, both compost and refuse need secure bins. Using a proper bird feeder or covered table is also a good idea if you want to encourage some of the wildlife but not all of it – remembering to clear up anything knocked off before nightfall, along with anything else that might seem attractive. Denying foxes a place to shelter can sometimes be as simple as blocking up gaps underneath garden sheds and outbuildings or tidying up an overgrown corner – in the wild foxes often rest beneath hedges and bushes. For the same reason, sheds, garages and outhouses should be secured at night. 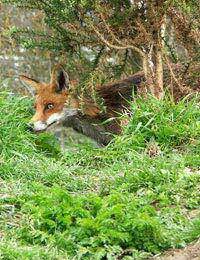 Chemical repellents can also sometimes be successful in preventing foxes adding your garden to “their” territory. Until very recently, Renardine – a bone-oil preparation – was probably the most effective available, having been in use to repel a variety of wild animals since the late nineteenth century. This product is now no longer legal to buy, use or store, but fortunately there are others on sale. To get the best results they can be used where the foxes enter, around any known resting places they use or anywhere which is repeatedly fouled – though you will need to remove the droppings first! This can be a very effective approach, but it does require patience and persistence; it is seldom a quick fix. A variety of deterrent devices are also available, which use Passive Infra Red (PIR) motion sensors to trigger a response to the fox’s arrival. Ultrasonic devices, are designed to produce sounds at a frequency that foxes find unpleasant, while motion-activated water-jets, fire a short, powerful burst of water towards the intruder. In an urban setting, completely eradicating foxes is inevitably difficult, costly and likely to upset at least some of your neighbours. However, fox problems can be managed by making your own property seem less appealing to them, minimising any nuisance they may cause you while letting others who welcome their visits, enjoy them.